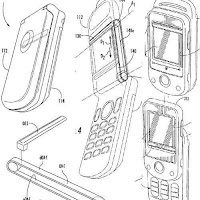 Okay, I could understand that some companies lose a lot of money by letting ideas go unpatented and having other companies patent it first but I really cant' understand what Sony Ericsson finds so patentable about a mobile phone with wiper. The wiper would just sit on the screen and move with the closing and opening of the clam shell phone. Novel idea, however, it's just another mechanism that may be broken and would add to the headache of replacing phone parts when your phone is no longer under any warranty. Let's just hope that Sony Ericsson tries to make the PSP phone a reality first than focus their attention on this one.